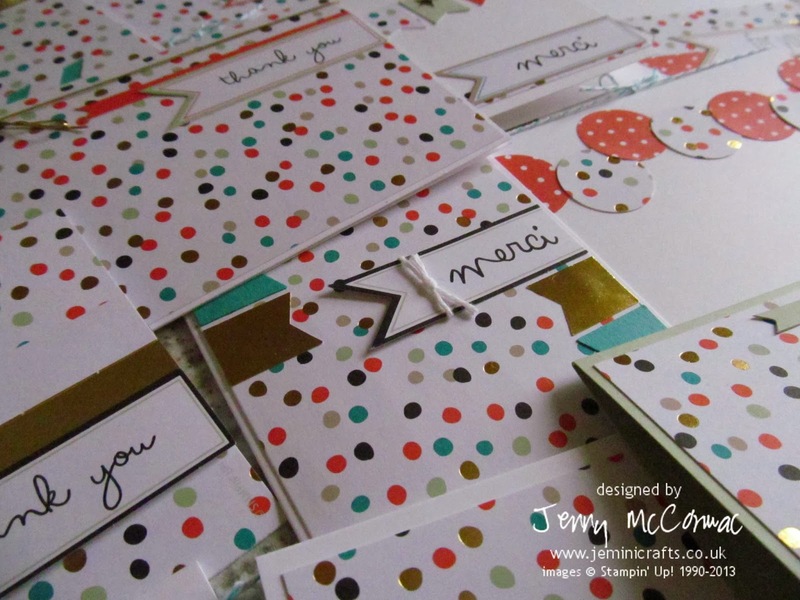 Jemini Crafts: Stack of Thank You cards and product peek ! Stack of Thank You cards and product peek ! Hello! It is so nearly 2014, and it is hard to believe we are about to start a new year already. 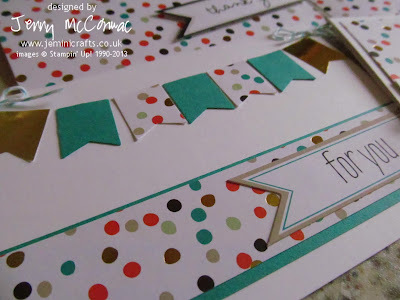 I have been busy making Thank you cards both for the children to send, and also to the latest members of my Monthly craft club* which starts 1st January 2014. It also means I can try out a new product which will be available at the end of January - a great 'ready to go' kit with everything you need to make a minimum of 8 cards. 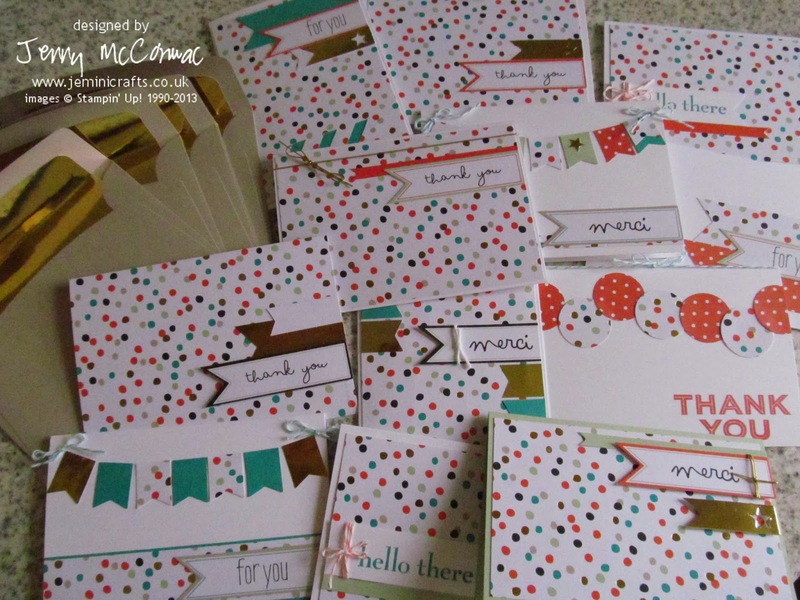 By adding a few card blanks and cutting up some of the cards, I have already made 12.... still with product to spare. You don't even need a stamp, as 3 different messages are included - in English, French and German! What's better - this kit can be yours for FREE with any £45 purchase from our catalogue! 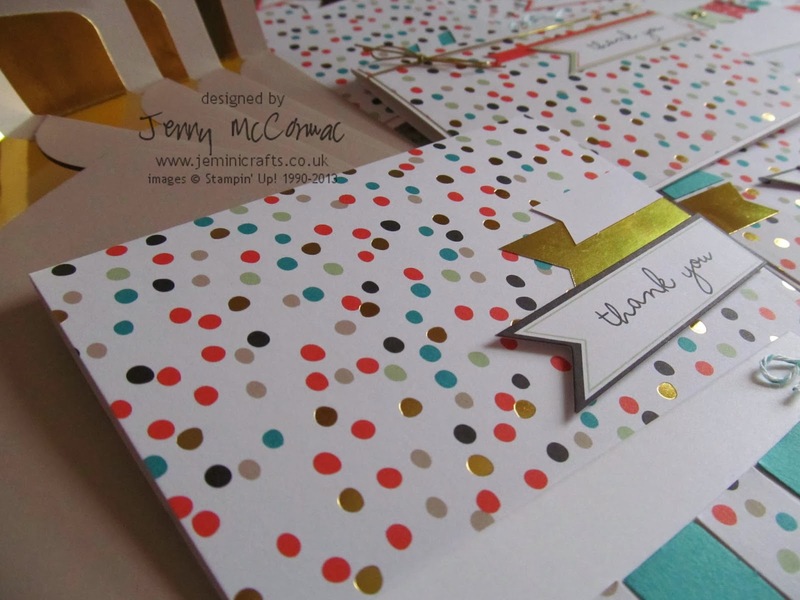 I just about fitted the 12 cards in the photo - you can also see the envelopes which also have gold liners inside. I used some of the gold liners to punch out the little banners. Here you can see the little preprinted banners - I used the English and the French titles. 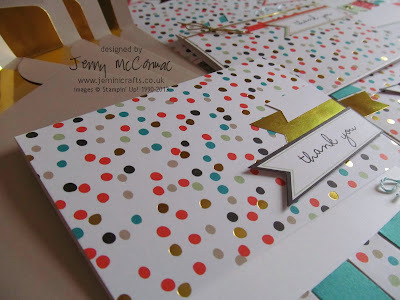 Above is a close up of one of the cards - you can see I have punched out the top banner using some of the spotty card and the gold inserts. The 'For You' message is one of the three preprinted messages included. 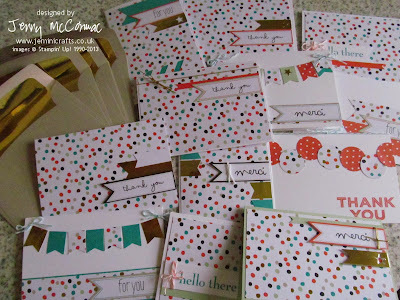 Finally a closer view of the envelopes, and one of the finished cards. Everything on this card is included in your kit - the twine, gold side banner, thank you message, white banner, card and envelope!